In this study, the evaluation of the recovery of aquatic plants used in wastewater treatment and discharged as waste is discussed. There are studies in the literature about the removal of pollutants from wastewaters by using different treatment methods in wastewater treatment. Many treatment methods are used in wastewater treatment as biological processes, chemical treatment, membrane systems and so on. However, such treatment methods are not preferred because of high energy costs and high operating costs, which cannot be applied to all kinds of water bodies. Therefore, natural treatment systems, which do not require much human power, can be applied to almost any kind of water mass with low operating costs and energy costs, can be used for the disposal of pollutants. In natural treatment systems, treatment with aquatic plants is generally used. Because, treatment with aquatic plants are quite economical when compared with other advanced treatment methods. Harvested plants can be evaluated in biogas production and bioethanol production as an alternative fuel. In addition, harvested aquatic plants can be used in biopetrol and biochar production by subjecting to pyrolysis treatment, thus recovering of the discharged wastes can be ensured. R.H. Kadlec, “Comparison of free water and horizontal subsurface treatment wetlands”, Ecol. Eng., 35, pp. 159-174, 2009. A.I. Stefanakis, C.S. Akratos, G.D. Gikas, V.A. Tsihrintzis, “Effluent quality improvement of two pilot-scale, horizontal subsurface flow constructed wetlands using natural zeolite (clinopilolite)”, Microporous Mesoporous Mater., 124, pp. 131-143, 2009. J.-H. Park, J.J. Wang, S.-H. Kim, J.-S. Cho, S.-W. Kang, R.D. Delaune, D.-C. Seo, “Phosphate removal in constructed wetland with rapid cooled basic oxygen furnace slag”, Chemical Engineering Journal, 327, pp. 713-724, 2017. J. Vymazal, L. Kröpfelová, “A three-stage experimental constructed wetland for treatment of domestic sewage: first 2 years of operation”, Ecol. Eng., 37 (1), pp. 90-98, 2011. W. Guan, M. Yin, T. He, S.G. Xie, “Influence of substrate type on microbial community structure in vertical-flow constructed wetland treating polluted river water”, Environ. Sci. Pollut. Res., 22, pp. 16202-16209, 2015. R. Bakhshoodeh, N. Alavi, A.S. Mohammadi, H. Ghanavati, “Removing heavy metals from Isfahan composting leachate by horizontal subsurface flow constructed wetland”, Environ. Sci. Pollut. Res., 23, pp. 12384-12391, 2016. S.-H. Kim, J.-S. Cho, J.-H. Park, J.-S. Heo, Y.-S. Ok, R.D. Delaune, D.-C. Seo, “Long-term performance of vertical-flow and horizontal-flow constructed wetlands as affected by season, N load, and operating stage for treating nitrogen from domestic sewage”, Environ. Sci. Pollut. R., 23 (2), pp. 1108-1119, 2016. J.A. Jacome, J. Molina, J. Suarez, G. Mosqueira, D. Torres, “Performance of constructed wetland applied for domestic wastewater treatment: case study at Boimorto (Galicia, Spain)”, Ecol. Eng., 95, pp. 324-329, 2016. J. Liu, N.K. Yi, S. Wang, L.J. Lu, X.F. Huang, “Impact of plant species on spatial distribution of metabolic potential and functional diversity of microbial communities in a constructed wetland treating aquaculture wastewater”, Ecol. Eng., 94, pp. 564-573, 2016. A.I. Stefanakis, E. Seeger, C. Dorer, A. Sinke, M. Thullner, “Performance of pilot-scale horizontal subsurface flow constructed wetlands treating groundwater contaminated with phenols and petroleum derivatives”, Ecol. Eng., 95, pp.514-526, 2016. M. Xu, W.J. Liu, C. Li, C. Xiao, L.L. Ding, K. Xu, J.J. Geng, H.Q. Ren, “Evaluation of the treatment performance and microbial communities of a combined constructed wetland used to treat industrial park wastewater”, Environ. Sci. Pollut. Res., 23, pp. 10990-11001, 2016. B. Li, H. Chen, N. Li, Z. Wu, Z. Wen, S. Xie, Y. Liu, “Spatio-temporal shifts in the archaeal community of a constructed wetland treating river water”, Science of The Total Environment, 605–606, 269-275, 2017. O. Sánchez, “Constructed wetlands revisited: microbial diversity in the -omics era”, Microb. Ecol., 73, pp. 722-733, 2017. M.P. Ciria, M.L. Solano, P. Soriano, “Role of Macrophyte Typha latifolia in a Constructed Wetland for Wastewater Treatment and Assessment of Its Potential as a Biomass Fuel”, Biosystems Engineering, 92 (4), 535-544, 2005. X. Jiang, X. Song, Y. Chen, W. Zhang, “Research on biogas production potential of aquatic plants”, Renewable Energy, 69, 97-102, 2014. S.K. Billore, N. Singh, J.K. Sharma, R.M. Nelson, “Horizontal subsurface flow gravel bed constructed wetland with Phragmites karka in central India”, Water Science and Technology, 40 (3), pp. 163-171, 1999. U. Stottmeister, A. Wießner, P. Kuschk, U. Kappelmeyer, M. Kästner, O.Bederski, R.A. Müller, H. Moormann, “Effects of plants and microorganisms in constructed wetlands for wastewater treatment” Biotechnology Advances, 22, pp. 93-117, 2003. S.M. Idris, P.L. Jones, S.A. Salzman, G. Croatto, G. Allinson, “Evaluation of the giant reed (Arundo donax) in horizontal subsurface flow wetlands for the treatment of recirculating aquaculture system effluent”, Environ. Sci. Pollut. Res., 19, pp. 1159-1170, 2012. F. Nsanganwimana, L. Marchand, F. Douay, M. Mench, “Arundo donax L., a candidate for phytomanaging water and soils contaminated by trace elements and producing plant-based feedstock, A review”, Int. J. Phytoremediation, 16, pp. 982-1017, 2014. M.W.H. Evangelou, A. Deram, F. Ugolini, S. Abiven, R. Schulin, “Soil application of biochar produced from biomass grown on trace element contaminated land”, J. Environ. Manage., 146, pp. 100-106, 2014. M. Vigil, M.F. Marey-Pérez, G. Martinez Huerta, V. Álvarez CabalIs, “Is phytoremediation without biomass valorization sustainable?-comparative LCA of landfilling vs. anaerobic co-digestion”, Sci. Total. Environ., 505, pp. 844-850, 2015. N. Oustriere, L. Marchand, E. Roulet, M. Mench, “Rhizofiltration of a Bordeaux mixture effluent in pilot-scale constructed wetland using Arundo donax L. coupled with potential Cu-ecocatalyst production”, Ecological Engineering, 105, 296-305, 2017. T. Pincam, H. Brix, F. Eller, A. Jampeetong, “Hybrid Napier grass as a candidate species for bio-energy in plant-based water treatment systems: Interactive effects of nitrogen and water depth”, Aquatic Botany, 138, 82-91, 2017. H. Gomes, “Phytoremediation for bioenergy: challenges and opportunities”, Environ. Technol. Rev., 1 (1), pp. 59-66, 2012. C.M.J. Williams, T.K. Biswas, I.D. Black, L. Marton, M. Czako, P.L. Harris, R.Pollock, S. Heading, J.G. Virtue, “Use of poor quality water to produce high biomass yields of giant reed (Arundo donax) on marginal lands for biofuel or pulp/paper”, Acta Hortic., 806, pp. 595-602, 2009. R. Pilu, A. Bucci, F.C. Badone, M. Landoni, Giant reed (Arundo donax L.): A weed plant or a promising energy plant?”, Afr. J. Biotechnol., 11, pp. 9163-9174, 2012. D. Scordia, S.L. Cosentino, J.W. Lee, T.W. Jeffries, “Bioconversion of giant reed (Arundo donax L.) hemicellulose hydrolysate to ethanol by Scheffersomyces stipites CBS6054”, Biomass Bioenerg., 39, pp. 296-305, 2012. A. Janejadkarn, O. Chavalparit, “Biogas production from napier grass (Pak chong 1) (Pennisetum purpurem × Pennisetum americanum)”, Adv. Mater. Res., 856, pp. 327-332, 2014. F. Promma, D. Thanaboripat, P. Sirirote, “Biogas production from 3 strains of Napier grass (Pennisetum purpureum)”, J. Sci. Ladkrabang, 23, pp. 30-50, 2014. W. Wilawan, P. Pholchan, P. Aggarangsi, “Biogas production from co-digestion of Pennisetum purpureum cv. Pakchong 1 grass and layer chicken manure using completely stirred tank”, Energy Procedia, 52, pp. 216-222, 2014. M. Lewis, M. Jackson, Nalgrass: a nonwood fiber source suitable for existing US pulp mills J. Janick, A. Whipkey (Eds. ), Trends in New Crops and New Uses, ASHS, Alexandria, pp. 371-376, 2002. N. Elhawat, T. Alshaal, E. Domokos-Szabolcsy, H. El-Ramady, G. Antal, L. Marton, M. Czako, P. Balogh, M. Fari, “Copper uptake efficiency and its distribution within bioenergy grass giant reed”, Bull. Environ. Contam. Toxicol., 95, pp. 452-458, 2015. H. Sun, Z. Wang, P. Gao, P. Liu, “Selection of aquatic plants for phytoremediation of heavy metal in electroplate wastewater”, Acta. Physiol. Plant, 35, pp. 355-364, 2013. V. Escande, T.K. Olszewski, C. Grison, “Preparation of ecological catalysts derived from Zn hyperaccumulating plants and their catalytic activity in Diels–Alder reaction”, C. R. Chim., 17, pp. 731-737, 2014. J. Yuan, S.S. Li, L. Yu, Y.M. Liu, Y. Cao, H.Y. He, K.N. Fan, “Copper-based catalysts for the efficient conversion of carbohydrate biomass into γ-valerolactone in the absence of externally added hydrogen, Energy”, Environ. Sci., 6, pp. 3308-3313, 2013. A. Toumpeli, A. K. Pavlatou-Ve, S. K. Kostopoulou, A. P. Mamolos, A. S. Siomos, K. L. Kalburtji, “Composting Phragmites australis Cav. plant material and compost effects on soil and tomato (Lycopersicon esculentumMill.) growth”, Journal of Environmental Management, 128, pp. 243-251, 2013. ISNAD Arslan Topal, E. Işıl , Topal, Murat , Öbek, Erdal . "Evaluation of Recovery of Aquatic Plants Used in Wastewater Treatment and Discharged as Waste". 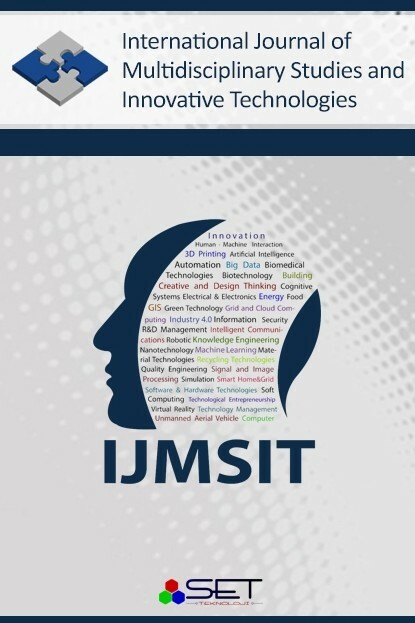 International Journal of Multidisciplinary Studies and Innovative Technologies 1 / 1 (November 2017): 21-23.